I spent 4 hours last night wrapping presents. Luckily I got everything wrapped and my two kids are now asleep so I can finish up with stockings and then go to sleep. I would love to say that I find the thrill of the pre-holiday prep exciting, but I don't. I'm a perfectionist so I tend to spread myself way too thin. For example last night while wrapping presents I was dying my hair since it was the only time I had. I decided to tip-dye my hair turquoise, which looks great (I know everyone is now dying to know what I look like-blue hair and all :). My house is now quite and this is my favorite time of the holidays, when my kids are in bed and I can relax since everything is done until I cook tomorrow. Everything is quite and perfect. And I'm eating pancakes, no joke, I love them. Last week I tried a new recipe for Carrot Cake Pancakes from the December issue of Southern Living magazine, which looked like a great recipe to make gluten-free. This recipe has 13 ingredients. It takes 50 minutes of total time, 40 minutes of which is active and makes 24 pancakes. Since the original recipe isn't gluten-free I made a number of changes. First I switched out the regular all-purpose flour for gluten-free all-purpose flour. I used low-fat buttermilk instead of full fat since that is the type I normally use in recipes. The recipe states that 1 pound of carrots equals 2 cups. I found that it took me far less than 1 pound of carrots to make 2 cups of shredded. Finally, I chose to top my pancakes with butter and maple syrup instead of the mascarpone cream suggested by the recipe. The cream looked way too rich for a breakfast food. I followed the remainder of the recipe as written. These were really fun pancakes. My kids liked that they tasted like carrot cake, but were pancakes. I liked that they were delicious with just butter as a topping and could be eaten as a breakfast or a dessert. I found the nuts a little rich, I think if I made the recipe again I would chop them smaller or reduce the amount. 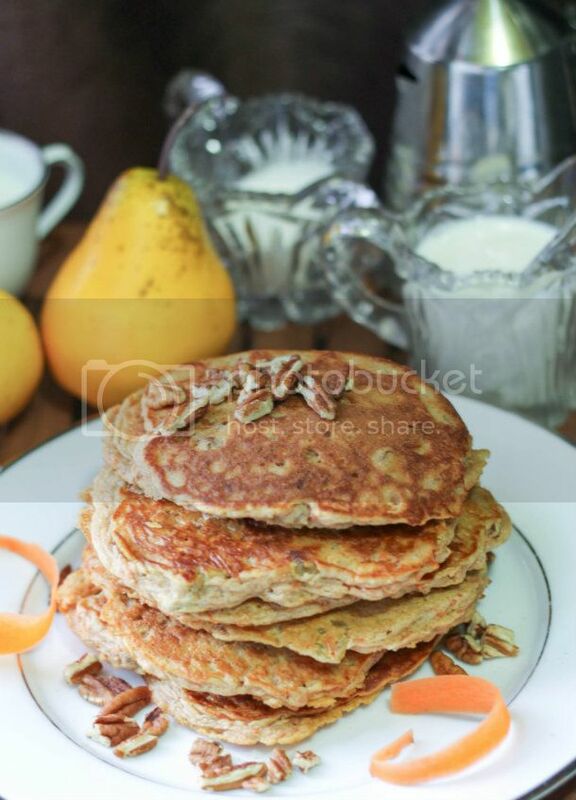 For the recipe go to Carrot Cake Pancakes. Hoping you'll link up to Wonderful Food Wednesday tomorrow! Thanks for the heads up, I linked up :) I hope you had a very Merry Christmas! Sound so yummy! Hope you had a fantastic Christmas. Wish you a peaceful New year! Those looks so good! I need to try that. I recently put up a post too about pancakes. Love them! Thanks :) I love pancakes also, they are yummy! Ooh yum! These look delicious! Merry Christmas! Thanks :) Merry Christmas to you too! What a great way to sneak in veggies at breakfast time. Awesome for picky eaters like my little one. Thanks...my son will definitely like these! Happy New Year. Visiting from Thursday Favorite Things. Thanks for all the sweet comments :) I love carrot cake also, it's yummy! Your carrot cake pancakes look scrumptious! I love carrot cake so these would be great too. I'm co-hosting this week with Katherine at Thursday Favorite Things. I hope you will stop by for a visit. Wishing you all the best in 2013. Thanks :) I love carrot cake also. Thanks for hosting! Stopping over from the blog hop! Now following you on Linky Friends! If you have a moment to follow back that would be wonderful! I followed you back. I love finding new blogs with moms of boys :) Come back again soon! My son is a pancake maniac too :) Going over to check out your blog! Oh yummy!!! I can only imagine how wonderfully tasty those are! Will definitely have to give it a whirl! Hey there! Just wanted to let you know that your recipe was featured on What's Cooking Wednesday this week. You can see it at http://www.turningclockback.com/2013/01/time-to-link-up-your-recipe-to-whats-cooking-wednesday.html I would love for you to come by and link up another one! I am so happy to be featured, thanks so much :) Going over to link up for this week!